Do I get your attention when I say crispy, golden fried chicken, blackened ribeye steak, baked hoe cake, seared tuna, blueberry buckle, baked apple coffee cake, pumpkin spice pancakes, fried cornbread? YUMMMM….right? Well, cast iron skillets are used every single day here at our old southern homestead! I have learned a few things about them through trial and error and I thought maybe I should pass along some valuable information about them so that you would know just how awesome this cookware really is. While cast iron has been around for at least a thousand years, we know that as far as the early 1900’s cast iron cookware was in most American kitchens. Back in the day, before “Teflon” and so called “non-stick” surfaces came along, cast iron cookware was an every day essential. In my opinion, it is still just absolutely the best cookware there is! Not only is it great for heat retention and even cooking, but it increases in monetary value. If taken care of, your cast iron cookware will last forever and it is one of the healthiest forms of cookware. With cast iron, you do not have to worry about some residue or harmful chemicals from the nonstick surface coming off onto your food. 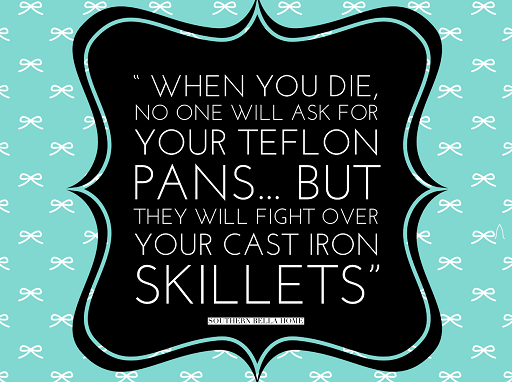 (unless you unfortunately suffer from a pretty rare condition called iron overload) It gives me peace of mind knowing that the pots and pans that I am using to cook for my family are safe and healthy. Now I know that some folks have convinced themselves that cooking with cast iron is “too hard” or clean up is “too messy”. 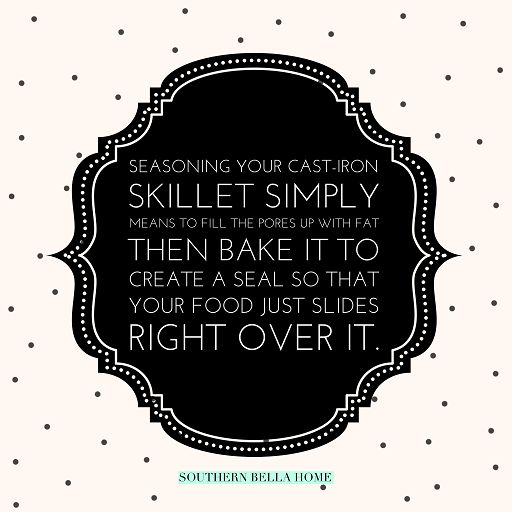 Maybe you have tried to use a cast iron skillet and have had trouble with food sticking. Well, while there definitely is a specific way to cook, and certain foods that do well in cast iron, and some foods that do not, it is pretty easy to learn. 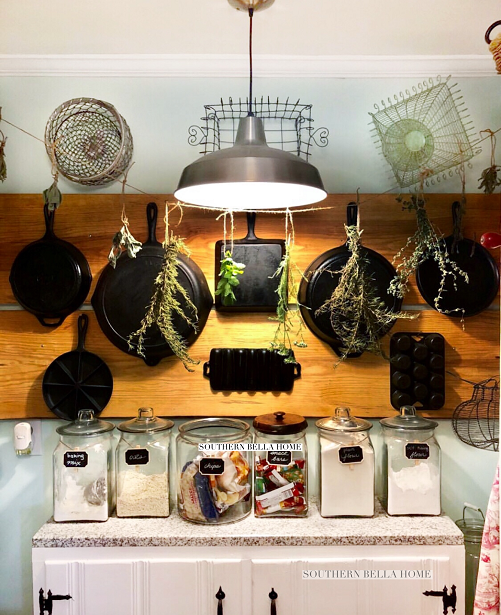 With a little information and learning how to take care of your cast iron cookware, please, for goodness sake, hear me girls….it is not hard to do! 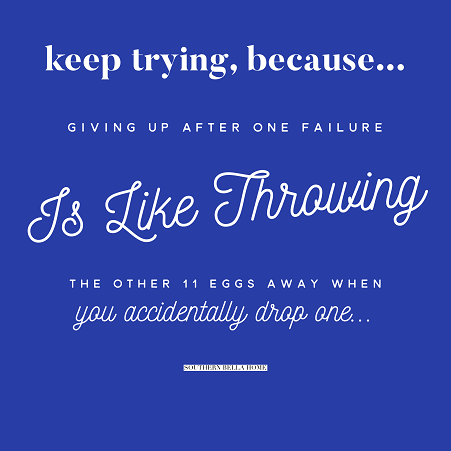 Trust me, YOU CAN DO THIS! Step 2: Next comes “seasoning”. Now some folks seem to think that there is some mystery to this process. But y’all, let me tell you, there is not! “Seasoning your cast iron simply means filling up those pores with fat so that food just slides right over them. The way we do that is by coating your piece with fat such as bacon grease, a non-GMO lard, flax seed oil, olive oil, etc. Now across the cooking world, on the internet, and in books on cast iron cookery, opinions vary on which fat works best. I suppose the thing to do is to try them one at a time, until you find the one that you prefer. Step 3: To cook with your seasoned pan, I have found that the best technique is to start with a really hot pan. I usually add some type of fat to my pan while heating. Once your pan is hot, you can place food on its surface. 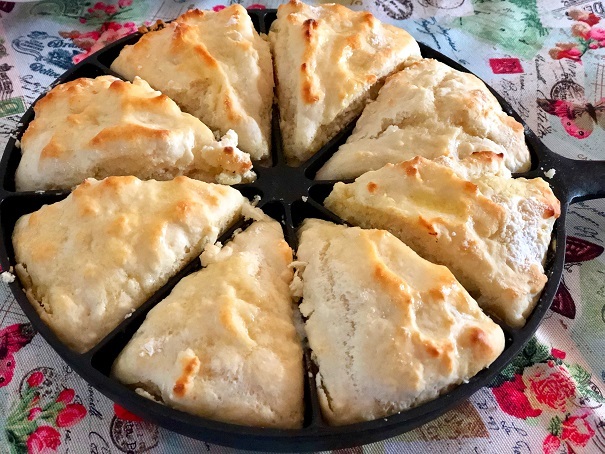 For cornbread, heat your pan in the oven with a little oil in it until it is hot and starts to sizzle, pour the hot oil into your batter and stir in until incorporated, then pour batter into pan and bake according to instructions. This gives your cornbread a wonderful crispness on the bottom. For scrambling eggs, get pan, containing fat of your choice (I use butter) very hot until fat starts to sizzle, add your scrambled egg mixture and let it form a “skin” before attempting to scramble the eggs. Then you will just continue to slightly move the egg mixture away from the sides of pan until they are all cooked. Then cut or scramble the eggs up with a small spatula. There should be no sticking! If you are concerned about the amount of fat in the eggs, you can drain them on a clean paper towel. I would not recommend making things like tomato sauce or very “liquidy” type foods in your cast iron. This cookware is best suited for more of a quick cook use or for baked items. More liquid dishes will harm your seasoned surface and you will have to repeat the process. Also, iron will leach out into foods that are highly acidic or cooked slowly. For most people, this is not a real issue, but there are a few folks who should be aware of this potential. Do your own research if you are iron sensitive. Step 5: And, for goodness sake, whatever you do, do not put cold water on a hot piece of cast iron.It will crack! And that would be Oh. So. Sad! Okay, my sweet friends, so those are the basics and really the only thing left to do is “go get to cookin”. In an upcoming blog post, I will be sharing some of my favorite recipes for things that I enjoy cooking in cast iron. Maybe you can try them yourself. I truly think you will love it, like so many people do! 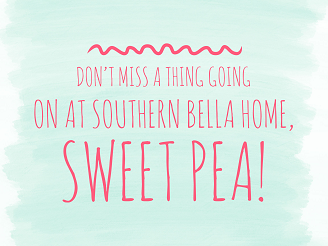 You will discover why so many sweet mommas have been cooking in them for so many years. 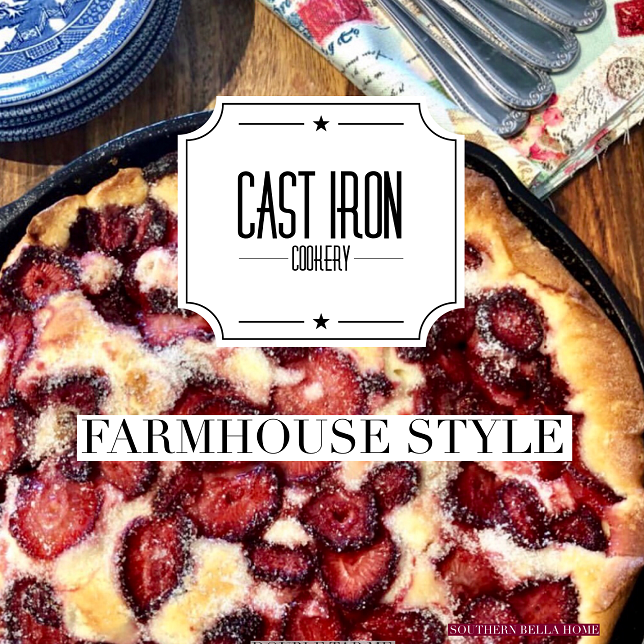 If you have any questions about cast iron cookery, I will do my best to answer them and if you have a favorite cast iron cookery recipe, please share it with the rest of us! I know that I would love to try it and others may as well! 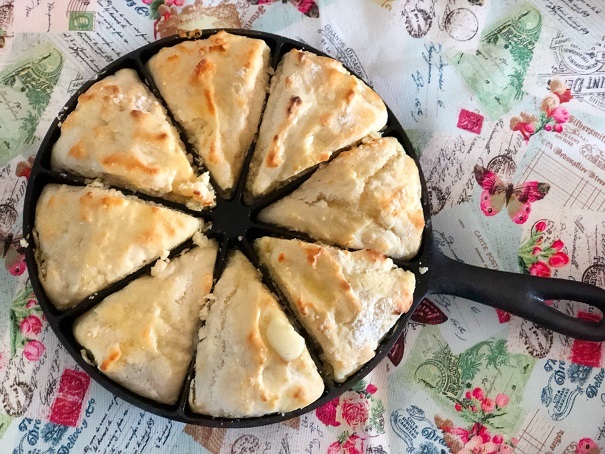 What are some of your favorite foods from a cast iron skillet? Now go and have a blessed day and cook up something good, y’ all! 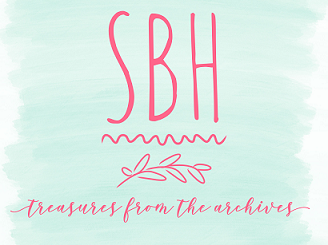 If you want to be the first to know what's happening at the farmhouse and get in on all the new decorating ideas, recipes, family celebration ideas, organizing tips, product reviews, seasonal home tours, notes from my heart and all the other goodness, then you need to subscribe to my email list! 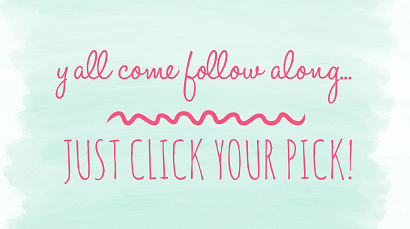 That way you won't miss a thing and you will even have the chance to win some goodies along the way! And the best part is that it doesn't cost a thing!